94 Landscape Architect and Specifier News I n f o r m a t i o n R e q u e s t # 5 3 6 reddish-green concrete pavers that simulate "greenstone," a local sandstone used throughout the town for walls, walks and buildings. Natural greenstone is no longer available, other than in limited amounts through salvage. Street furniture, street/pedestrian lights, signage underground electric lines, and irrigation lines were located in the amenity zone leaving the pedestrian zone clear of obstacles. The pavers will allow for easy repair of the lines if needed. • The creation of the Shoshone Spring and Cheyenne Spring pocket parks provided opportunities for historic interpretation, access to mineral spring waters, pedestrian rest areas, and children play areas. The design included new fountains, paving and plantings. • The relocation of the Stratton Spring font, replacing the old wooden arbor with a new metal arbor, and construction of a new base for the font sculpture. • Removal and undergrounding of overhead utility lines and the removal of associated utility poles, thereby eliminating a source of significant visual pollution and opening up views of the streetscape and surrounding mountains. 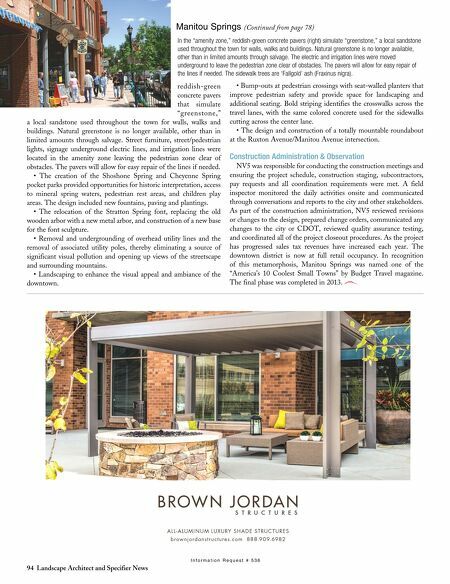 • Landscaping to enhance the visual appeal and ambiance of the downtown. 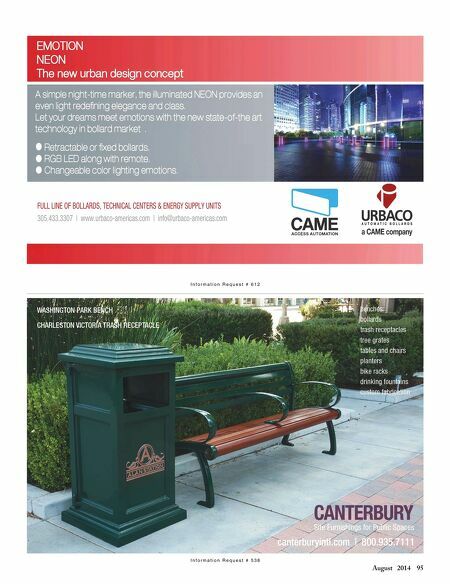 • Bump-outs at pedestrian crossings with seat-walled planters that improve pedestrian safety and provide space for landscaping and additional seating. Bold striping identifies the crosswalks across the travel lanes, with the same colored concrete used for the sidewalks cutting across the center lane. • The design and construction of a totally mountable roundabout at the Ruxton Avenue/Manitou Avenue intersection. Construction Administration & Observation NV5 was responsible for conducting the construction meetings and ensuring the project schedule, construction staging, subcontractors, pay requests and all coordination requirements were met. A field inspector monitored the daily activities onsite and communicated through conversations and reports to the city and other stakeholders. As part of the construction administration, NV5 reviewed revisions or changes to the design, prepared change orders, communicated any changes to the city or CDOT, reviewed quality assurance testing, and coordinated all of the project closeout procedures. As the project has progressed sales tax revenues have increased each year. The downtown district is now at full retail occupancy. In recognition of this metamorphosis, Manitou Springs was named one of the "America's 10 Coolest Small Towns" by Budget Travel magazine. The final phase was completed in 2013. Manitou Springs (Continued from page 78) In the "amenity zone," reddish-green concrete pavers (right) simulate "greenstone," a local sandstone used throughout the town for walls, walks and buildings. Natural greenstone is no longer available, other than in limited amounts through salvage. The electric and irrigation lines were moved underground to leave the pedestrian zone clear of obstacles. The pavers will allow for easy repair of the lines if needed. The sidewalk trees are 'Fallgold' ash (Fraxinus nigra).